Somehow, this sweet potato pancakes recipe from 3 years ago got lost in cyperspace. Since it is a very popular breakfast recipe, I wanted to recreate it for you. They are delicious and a great way to use up leftover sweet potatoes! Sweet potatoes are very popular here in Georgia and a crop I have actually had decent success growing in my garden. Of course, when you grow sweet potatoes in the garden, you are left with so many sweet potatoes you have no idea what to do with them all! Pan fried, oven roasted, mashed and turned into fries. There are a lot of ways to use up too many sweet potatoes and sweet potato pancakes are a delicious one. So, for these sweet potato pancakes, just bake the sweet potato in foil for about an hour at 425 degrees. Do this ahead of time so you can let it cool. Handling hot sweet potatoes is not fun! We made these sweet potato pancakes for dinner and they are filling but oh so tasty! They make a delicious and healthy breakfast recipe but we also do breakfast for dinner quite often as well. Serve with real maple syrup and some cinnamon honey butter and you will have a happy and well fed family! To make the honey butter: Put all ingredients in a large bowl and whip until smooth and creamy. Using a small scoop, scoop onto a piece of parchment paper and chill. Cook approximately 1/2 cup of batter per pancake in buttered skillet until bubbles form on the surface, then turn over and cook until dark golden brown. Feel free to share your own sweet potato recipe in the comments below! 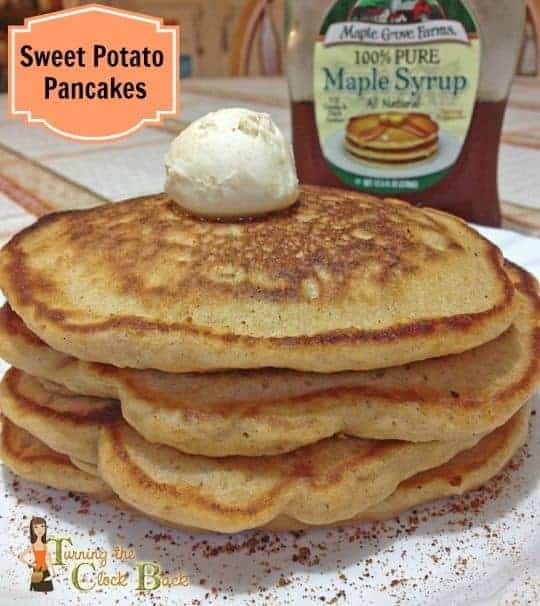 I've never tried Sweet Potato pancakes but it seems like it would be delicious including the cinnamon honey butter. Great idea and recipe. glad you found the recipe tempting! I love flavored butters!